Inattentional Blindness – does this apply to pre-hospital medicine? A recent study (not sure if it’s been published yet but will be soon) studied the ability of radiologists to accurately identify abnormalities on a CT scan. We’re talking board-certified, full fledged radiologists! I can’t take credit for coming across this paper – check out @TechnicalSkillz, ED physician in Toronto who tweeted the link. He has a real interest in cognitive biases and medical decision making. Anyways…I digress. 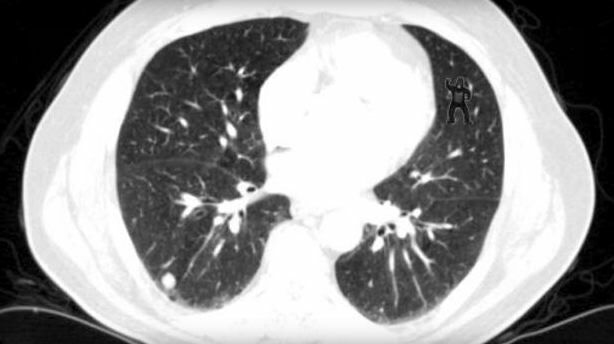 This image was presented to radiologists after they were told to look for abnormalities including lung nodules. Do you see the abnormality? Don’t worry…you don’t need to be an expert at reading CTs…it should be obvious! 24 radiologists examined this image and 20 were not able to identify the gorilla in the upper right corner! 20/24 didn’t see it! that’s unbelievable. They’re so focused on looking for other things that they glazed right over it. Using eye tracking technology, the reserachers were able to show that impressively 12 looked directly at the gorilla but still they didn’t see it! I think this happens not infrequently in pre-hospital medicine and the emergency department. How many times does the patient turn out to have an entirely different presentation from what we hear over the radio call out or what’s written on the triage note. Right from the beginning we’re biased by the what we hear…it may be the local clinic calls with “a 73yr old with pneumonia”. Maybe there’s some shortness of breath to reaffirm this diagnosis but just as the radiologists were looking for nodules, we might be looking for pneumonia and miss the pneumothorax because we didn’t find out the patient fell earlier today. It could have been obvious if we just auscultated the lungs more closely but because we were thinking about crackles, we didn’t anticipate there would be absent breath sounds. I think we’re especially vulnerable in the pre-hospital setting to inattentional blindness. We receive limited and often wrong information. Add that to time pressures to reduce scene times and it’s very easy to succumb to such cognitive biases. We must implement cognitive checks to ensure that diagnoses are not missed. Standardized approaches to common presentations can help to ensure that critical diagnoses are considered regardless of the presentation. Efforts to ensure strong team communication will also enhance diagnostic abilities – maybe someone else on your team saw something you didn’t but failed to mention it. Awareness of pitfalls around diagnostic errors must extend to pre-hospital clinicians. This will help us identify those gorillas! Check out some of the work by Pat Croskerry who’s a world leader in medical decision making, cognitive biases and diagnostic error (plus he’s Canadian, so he must be great!). Please note, the author of this post is Canadian which may be the reason for this conflict of interest! This entry was posted in Education, prehospital medicine and tagged cognitive error, inattentional blindness by petro82. Bookmark the permalink.